The Buddy Ball Division of Pelham Baseball is a program for players with intellectual and physical disabilities to enjoy the full benefits of Cal Ripken participation in an athletic environment structured to their abilities. The two most important aspects of the Buddy Ball Division are safety and fun. We promote a safe, fun environment for players with special needs to play baseball and socialize with their peers. We use a soft core baseball to protect the players, and involve every player in the field with every play from the plate, so that the players are continuously engaged in the game. In our games, every player hits, runs the bases and touches home plate. There are no outs. We do not keep score. Most games are two innings long, with each team batting through their roster twice. Sometimes we play an extra inning if the players are up for it and time permits. A unique experience in Buddy Ball Baseball is the use of “Buddies.” Buddies are siblings, classmates, friends and peers who volunteer to help the Buddy Ball players field, bat and run the bases. We encourage the Buddy Ball players to do as much for themselves as they can, and the Buddies are always there as support. Games are on Saturday mornings at Lyons Park in Pelham at either 9:00 or 10:30 a.m. Practices are on Wednesday evenings at Lyons Park from 6:00 to 7:00/7:30 p.m., depending on how the players are doing. We play one combined game on a Friday or Saturday night under the lights at the Majors field at Muldoon Park, which is the highlight of the season for many players. For others, the highlight of the year is the end-of-the-season celebration and trophy presentation at Chunky’s in Pelham. 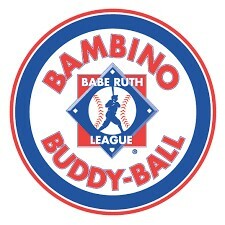 Registration forms for the Buddy Ball Division can be found under "Documents" on our website. For further information, please contact David Williams, Vice President of the Pelham Baseball Buddy Ball Division (“2019 Board Members” section on our website).